Did you know that more than half of the population snores? Do you occasionally snore or sleep with someone who does? Not only is snoring a nuisance, but many snorers suffer from obstructive sleep apnea as well. Sleep apnea is often associated with difficulty breathing thus leading to a poor night’s sleep. Daytime drowsiness can occur, and your quality of life decreases. Sufferers from prolonged sleep apnea can often end up with higher blood pressure which could ultimately lead to heart disease. There have been many claims of miraculous cures for the snoring epidemic and other similar breathing problems. But the primary focus is being able to breathe easily and get a great night’s sleep. Using Breathe Right Strips could be the perfect solution. When you sleep, your muscles relax. As air is pulled in, the tongue pulls up against the soft palate in the back of your throat and the opening narrows causing a vibration of the tissues. Because it closes all the way, no air is able to get in, thus causing a deprivation of oxygen and your brain sends a message to your body to wake up. Nasal congestion– snoring begins in the nose so keeping nasal passages open may help. 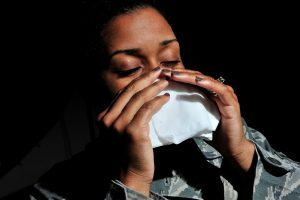 Nasal congestion is often the result of a cold, sinus infection, and allergies causing a stuffy or a runny nose, mucus buildup, and swollen nasal tissue. Deviated nasal septum occurs when the thin wall between the nasal passages is displaced to one side. A misaligned nasal septum makes it difficult for air to pass through the nostrils. Accompanied by nosebleeds, sinus infections, and facial pain, a deviated septum can contribute to difficulty in sleeping. The anatomy of your mouth– People who are overweight tend to have a low, thick soft palate. Due to extra tissue in the back of their throats, the airway narrows and airflow can be obstructed. Sleep position – snoring is typically the loudest when the person is sleeping on their back as gravity affects the throat and narrows the airway. Losing sleep from constantly being awakened by your snoring can put a damper on your day or that of one sleeping near you. You tend to become easily irritated and are sleep deprived. There are dozens of products that claim to provide a solution, however, most of these products, such as nasal sprays and decongestant medicines, contain chemicals and other unnatural ingredients. 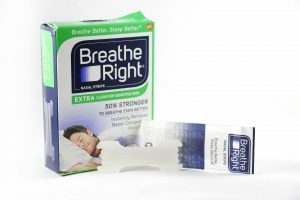 The Breathe Right Strips open your nasal passageways in a natural drug-free way to help in correcting night-time breathing difficulties, especially nasal congestion and problems with a deviated septum. Nasal strips have been used for several years as a noted relief aid for breathing problems. It’s a natural method of creating a clearer airway for oxygen to enter and exit the body and is ideal for people suffering from snoring. Breathe Right Strips are a kind of adhesive bandage with embedded plastic strips that are applied to the bridge of the nose and across the flare of each nostril. They act as a kind of external nasal dilator. If you are having problems with your nostrils shutting down, it basically gently pulls them up allowing for better airflow giving you immediate and continued relief. Breathe Right Strips are useful in increasing the volume of airflow through the nasal cavity in the front inch and a half of your nose. 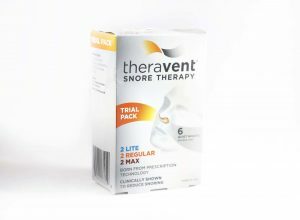 For chronic snorers, they have been shown to reduce the loudness of snoring and improve the quality of sleep for not only the snorer but the others around the snorer. If you’re congested from a cold or allergies, you already know the airway is somewhat blocked making it difficult to breathe. By using a Breathe Right Strips, the passageway is widened and there is less airflow resistance making it easier to breathe. If you suffer from a deviated septum, relief is here. A deviated septum is a deformity of the nose. This deformity prevents the natural division of the cartilage and bone in the nose. It collapses one side of the nose or nostril. When this occurs, breathing can be challenging and air intake limited. The Breathe Right Strips provide an easy solution by pulling back the nostrils to give a larger available airway providing temporary relief. 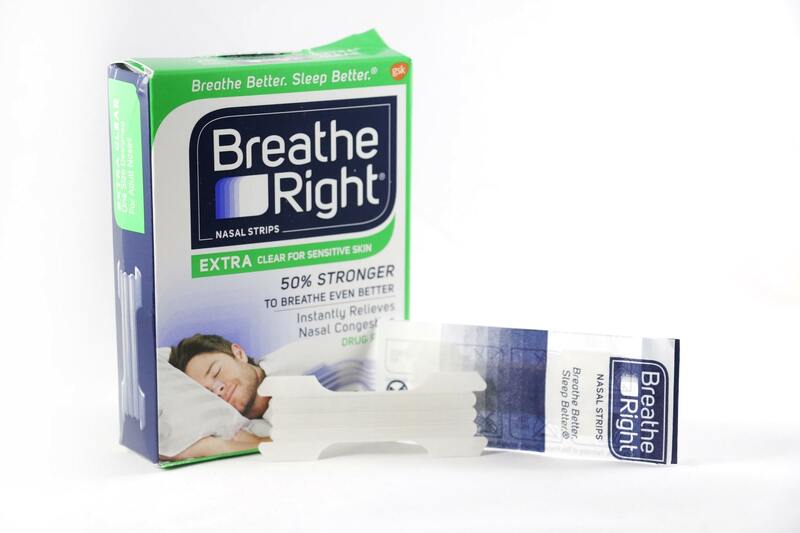 If you are among one of the many who snores, whether it is from congestion due to a cold, allergies or sinus infections or if you have a deviated septum, Breathe Right Strips are the perfect non-drug alternative to a good night’s sleep.